Who is your Catch Up® Coordinator? 12th May 2017 - Who is your Catch Up® Coordinator? Free tools and support to manage the interventions – request a Catch Up® Coordinator pack! Evidence shows that effective management is the most significant factor in the successful implementation and delivery of the Catch Up® interventions. This is why we recommend every school nominates a Catch Up® Coordinator - and why we have made lots of useful free tools to help them in their role! The Catch Up® Coordinator is the person who takes responsibility for ensuring the successful implementation of the Catch Up® interventions in your school or setting. Find out more about the role on our recent blog. As part of your Training and Support package, there is a wide range of support tools available, free of charge, to help the Coordinator successfully implement and sustain the interventions. Who is your Catch Up® Coordinator? 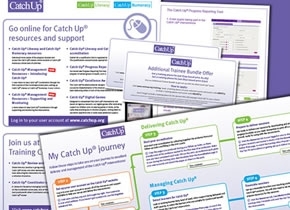 Help make sure that they know about all of the support resources available to them to enhance the impact of the interventions, with the Catch Up® Coordinator pack – designed to help Coordinators use all of the free support and resources available. If you would like a pack, let us know and we will send you one in the post, along with a copy of our new 'My Catch Up® Journey' guide for each of your trained staff . This support is designed to help ensure that your school is getting the best from the Catch Up® interventions. Remember, all of the additional support and training sessions are free of charge, included as part of the training and support package you have already purchased. Request a pack now!